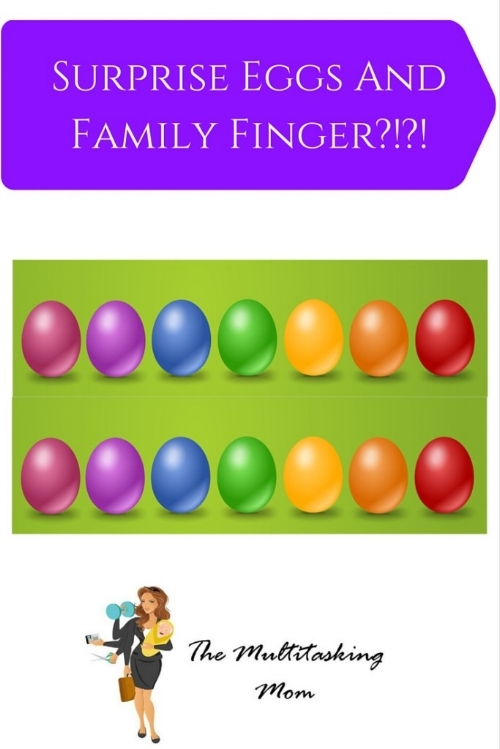 Surprise Eggs And Family Finger?!?! You can find surprise eggs all over YouTube from all different channels and accounts. Some videos provide narration of the toys that are found in the eggs, others just provide music. The eggs are either plastic or chocolate wrapped in foil and generally feature various cartoon characters. Inside the eggs are small toys, stickers and key chains. Surprise eggs are difficult to find in the states as they are not distributed in the U.S.. This led us to have to order these eggs online so my son could open a few of his own. We have purchased a few boxes which we have given to him for special occasions. On the other hand, the watching of egg videos eventually leads to watching videos for Shopkins and Mashems and pretty much any other toy that comes in a blind bag or surprise box. These other toys are available in the U.S. These videos can be anywhere from basic to elaborate with puppets, animation, and giant eggs decorated in play doh to look like popular characters. My son can now sit and watch several videos of people unwrapping surprise toys in a row and be fully entertained. He now knows characters from shows he's never even seen because he's watched the toys unwrapped. He can even narrate a few of the videos with the host. One time we went to a friends house who has a daughter about 6 months younger than T (my son) and she was watching Bubble Guppies. My son immediately started naming the characters. My friend asked me if he liked the show. I responded, "He's never seen it. He just knows them from watching their toys being unwrapped on YouTube." She looked confused; I told her just wait, her daughter will be doing it too! Due to this obsession, we now have 15 Mashems at home several Shopkins, a minecraft mini figure and a few mini pops from Funko. When at the store my son will recognize any toy that comes in a surprise bag or box and proudly announce the name of the character. While this makes is easy to pick little toys every once in a while that we know he'll love, it makes it difficult to walk by the toy aisle of any drug store. This video has thousands of versions using images of pretty much every cartoon character. So for example, there's a Toy Story family finger where each finger is one of the characters from the movie: daddy finger = Woody, mommy finger = Bo Peep, brother finger = Buzz, sister finger = Jessie, baby finger = Potato Head. The song is pretty catchy much to every parent's chagrin. My son has taught every member of our family the family finger song. He can sing this song endlessly without getting bored. Somehow he doesn't find it as mind numbing as his parents do. Luckily, we are not alone. My husband was in H & M recently and he heard another toddler singing the family finger song. The toddlers dad confirmed that his daughter was also obsessed with the videos on YouTube. Is your toddler or preschooler obsessed with family finger or surprise toys? Are they obsessed with something else from YouTube?